The Oracle is perhaps the most intricate design yet from SYN. 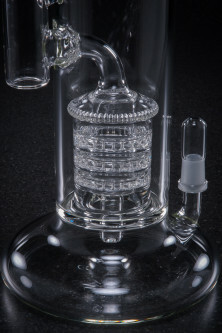 This is a massive 5 perc behemoth that can impress even the most seasoned buyer. 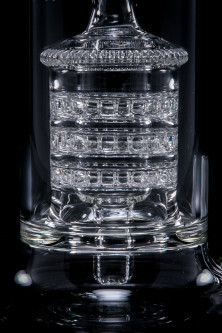 A fixed downstem runs through a large assembly into a large beaker foot. This jackhammer perc throws water upwards into a series of ratchets and explodes out of an inverted showerhead. The water is being diffused at every seal on this tube, making one of the purest smoke cleaning systems on the planet.